(CNSNews.com) - The United States lost 9,000 manufacturing jobs in October while gaining 19,000 jobs in government, according to data released by the Bureau of Labor Statistics. Manufacturing employment peaked in June 1979 at 19,553,000. Since then, manufacturing employment has declined by 7,295,000—or 37.3 percent—to its current level of 12,258,000. In June 1979, when manufacturing employment hit its peak, government employment was 16,045,000. Since then, government employment has increased by 6,190,000—or 38.6 percent—to its current level of 22,235,000. The 22,235,000 employed by government exceed the populations of 48 of the 50 states. Only California, which the Census Bureau estimated had a population of 39,144,818 in 2015; and Texas, which the Census Bureau estimated had a population of 27,469,114, had populations that exceeded the number of people in the country who work for government. The 22,235,000 government employees as of October, for example, exceeded the population of Florida (20,271,272) and the population of New York (19,795,791). 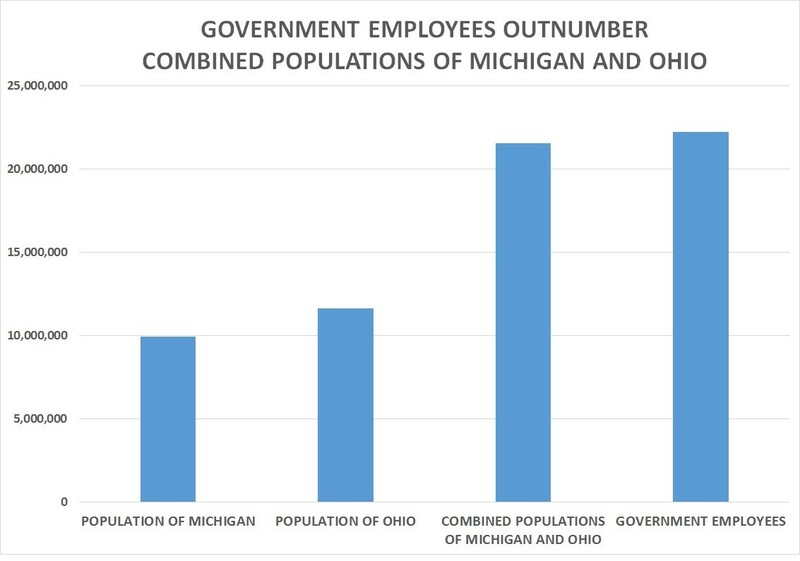 The 22,235,000 employed by government also exceed the combined populations of Ohio (11,613,423) and Michigan (9,922,576)—which equaled 21,535,999. 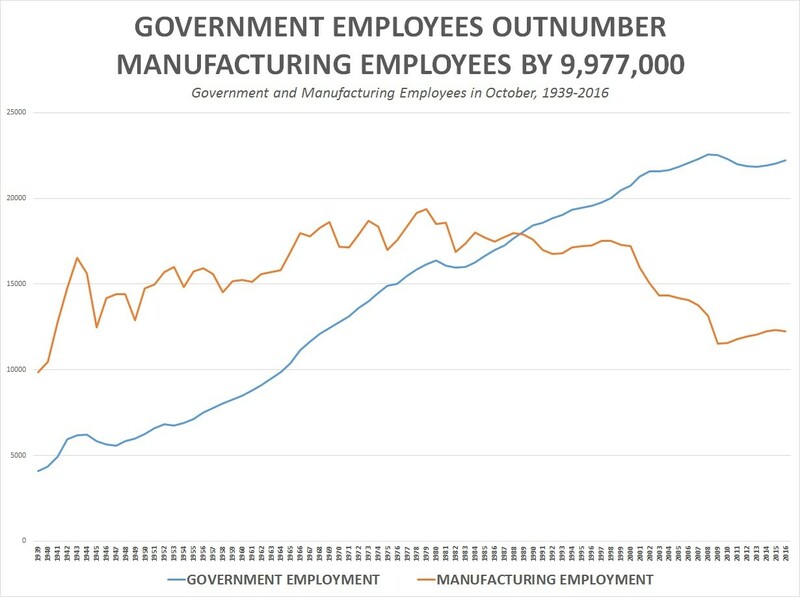 The 22,235,000 government employees in October, according to BLS, included 14,297,000 local government employees, 5,123,000 state government employees, and 2,815,000 federal government employees.